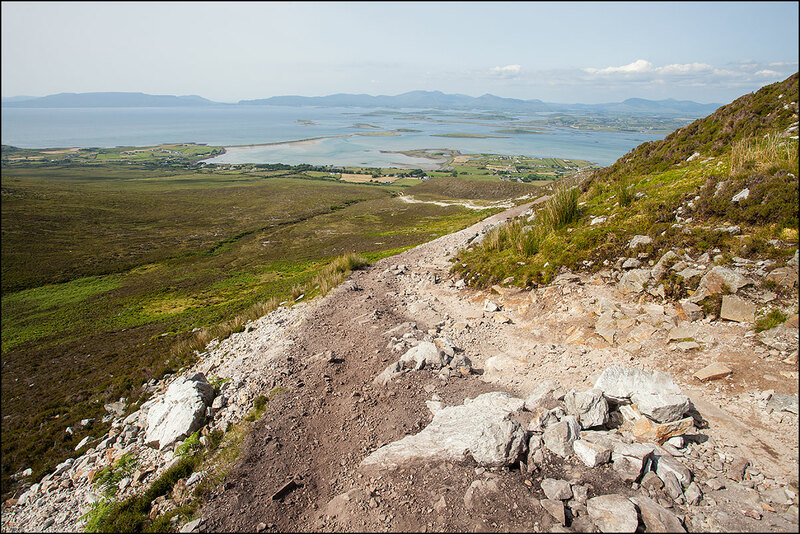 Another box in my “to do” list was ticked on Thursday – I climbed Croagh Patrick, Ireland’s sacred mountain. I had intended doing it when I was up in Mayo last year but weather conditions were poor on the day and I didn’t attempt it. I took advantage of the exceptionally good weather this week and, on a whim, I set off for Murrisk – the village at the foot of the mountain – for a three and a half hour drive from East Cork on Thursday morning. I arrived at the car park at the base of the mountain around 2pm. I was going to wait until after 6pm before heading up. The average time for the 7km round trip is between 3 and 4 hours and with sunset not due until 10:05pm I had plenty of time before darkness fell. In any case I had my head-torch so the prospect of walking in darkness didn’t worry me. However, after checking into the B&B across the road and after a cool drink in The Tavern I figured I might as well start the climb. I would take it easy as I wanted to be on the summit near sunset. It was now 4pm. 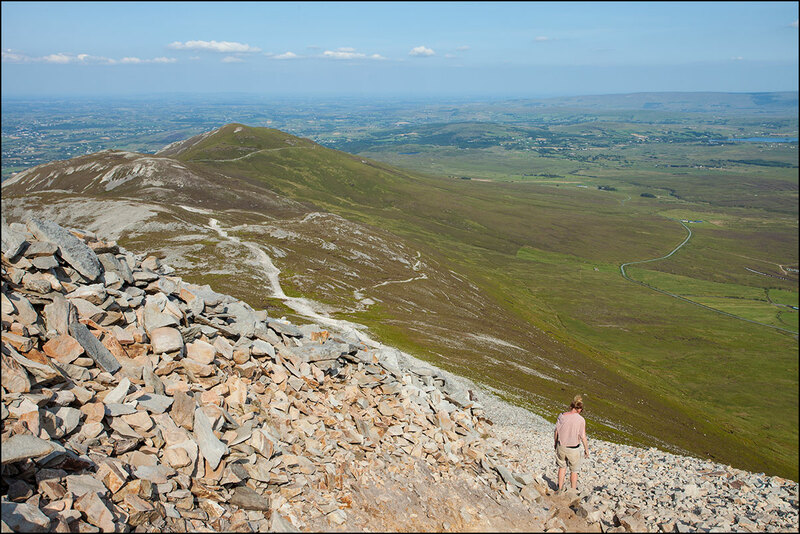 Croagh Patrick is 2,507 feet (762 metres) high – 100 feet lower than Knockmealdown which I climbed a few weeks back. However, it is a much tougher prospect as one has to climb every one of those feet as it starts at sea level. 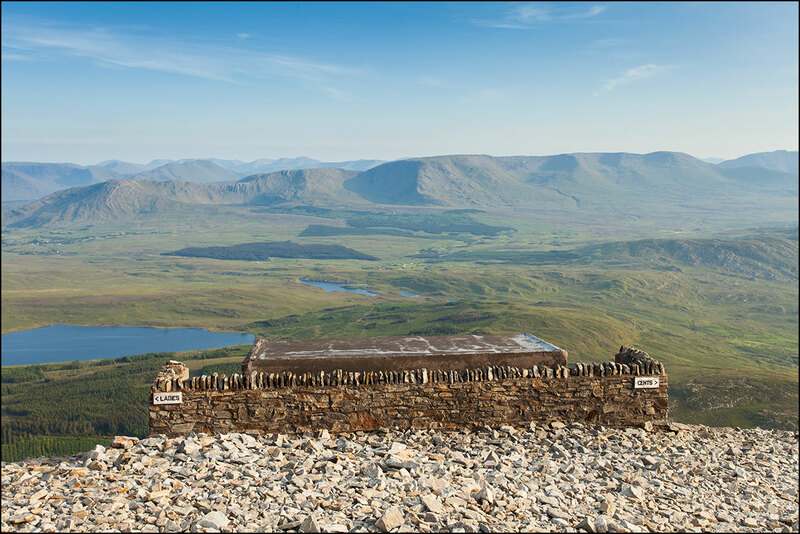 The Reek as it is known is of course the most climbed mountain in Ireland as it has been a place of pilgrimage for hundreds of years. 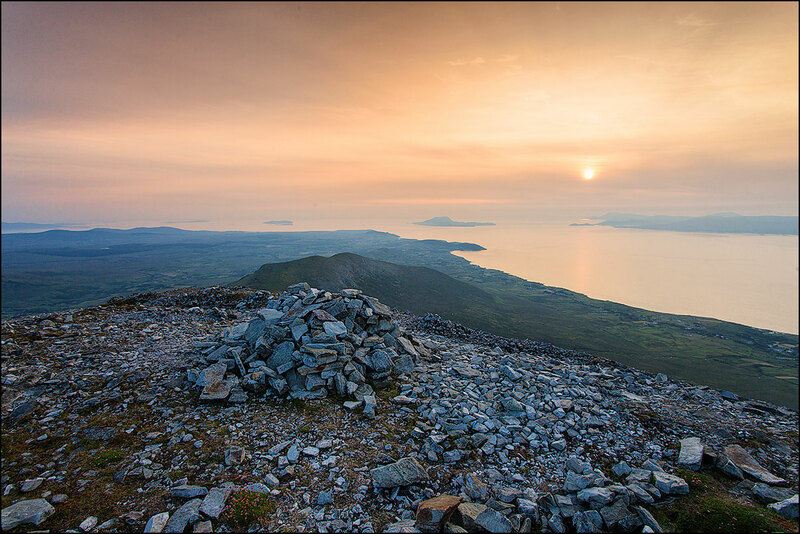 St. Patrick is supposed to have spent 40 days fasting on the summit after which he banished snakes from Ireland! There is evidence that it was also a place of significance in the pre-Christian era and may have been used for Summer Solstice ceremonies. 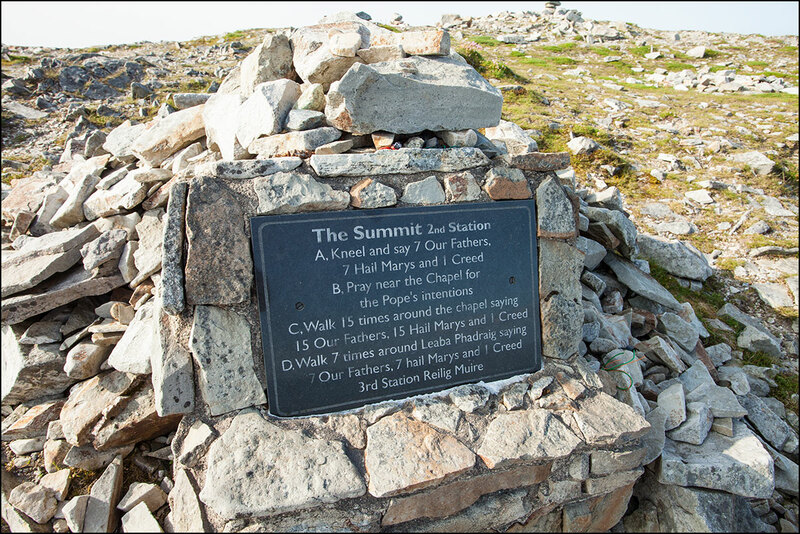 The highlight of the modern pilgrimage is Reek Sunday, the last Sunday in July when in excess of 15,000 people make their way to the chapel on the summit. It is particularly popular among members of the Travelling Community many of whom do some sections of the walk barefoot. There is a significant macho-man element in the latter, I am told, but whether that is the case or if it is purely penitential I do not know. Regardless of the reason it is astonishing that it is done at all – the ground underfoot is rocky and sharp; it is difficult enough with good footwear – it must be horrendously painful in one’s bare feet. There is a stall selling walking sticks as you exit the car park towards the start of the walk and it is highly recommended that you purchase one as the upper reaches of the climb are over loose scree and you need all the support you can get. I had my Manfrotto monopod and I used that instead. The path up is, as to be expected, well defined and there is a constant trickle of people negotiating it. 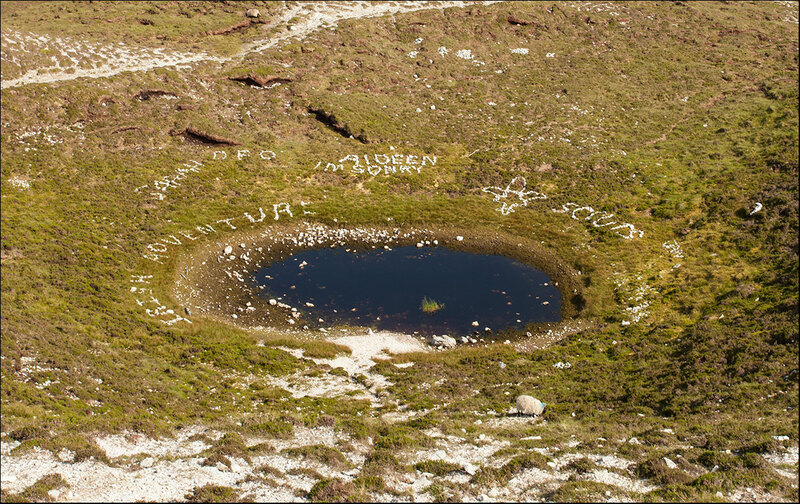 It is a straightforward trek up to the saddle with only a few loose rock stretches. 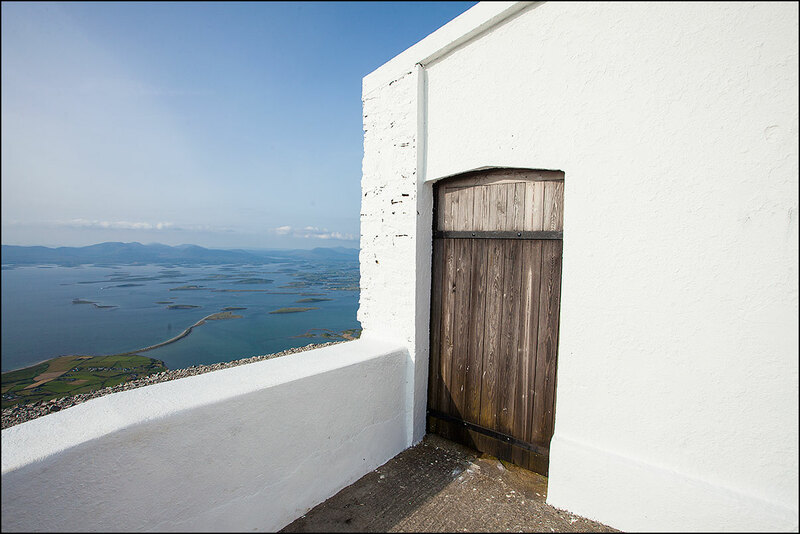 As you ascend, the beautiful vista of Clew Bay and its islands open out below you. One of those islands is Dorinish which was once owned by John Lennon but was sold by Yoko Ono after his death. 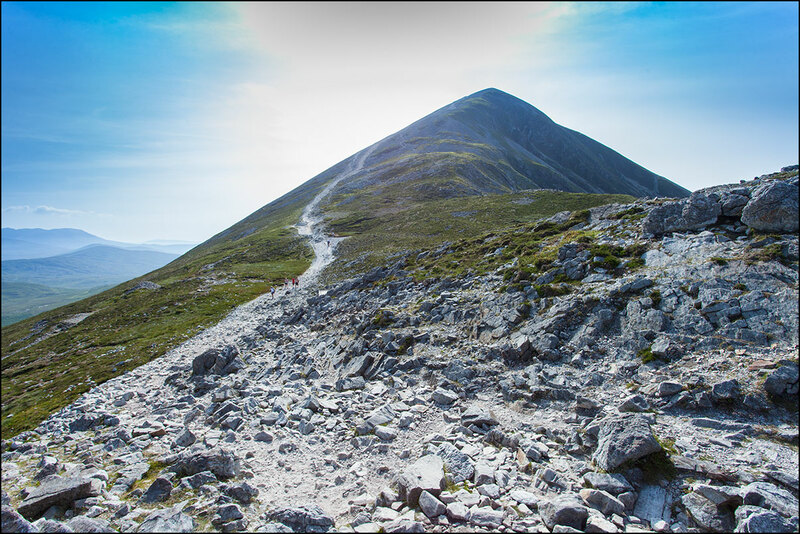 The saddle affords fine views to the south and the path takes an easy level course until the base of the upper cone. 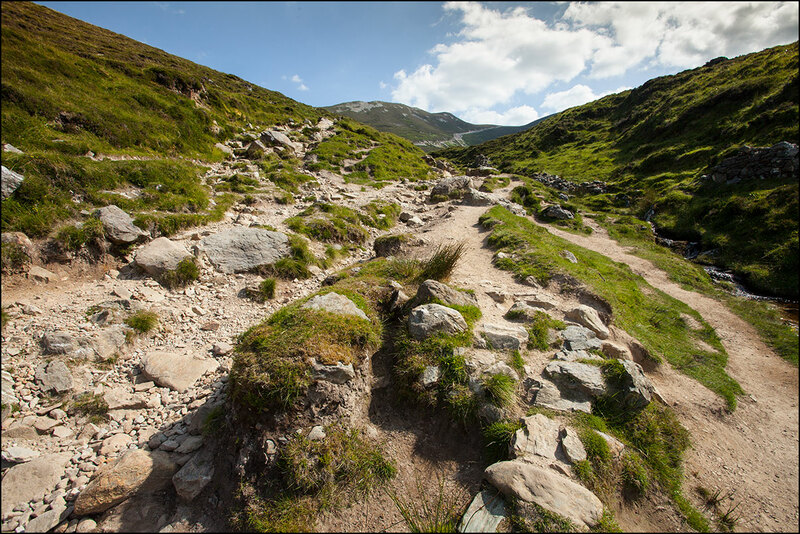 The path now veers steeply upwards across loose scree and it is difficult going. The best bet is to keep to the right of the path where there are more firm footholds. This was easy enough to do on the day with few people about; how it must be on Reek Sunday I can only imagine. I was relieved to reach the top. It was calm and very hot. 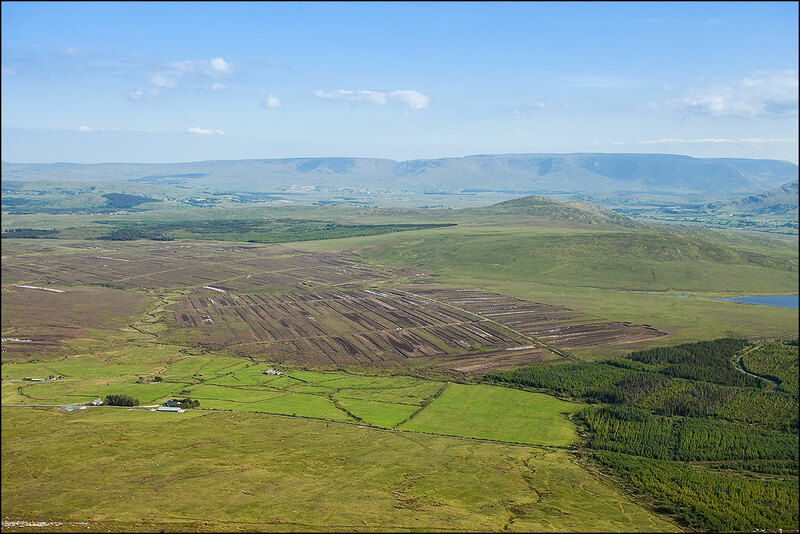 The views across all the compass points were magnificent. The chapel itself was closed but a small window showed the basic interior with the centrepiece being a large statue of St Patrick. The gleaming white of the exterior leant the scene a Santorini-like effect especially given the blue sky and the dead heat of the day. 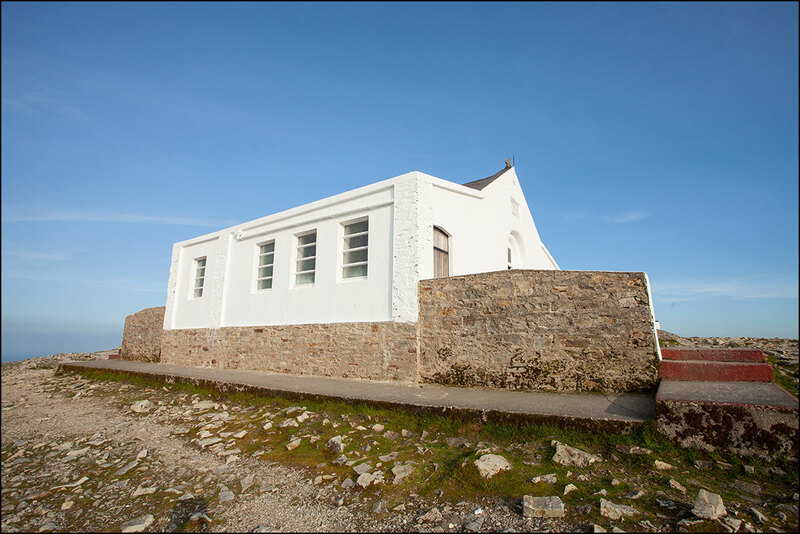 The chapel was built in 1905. 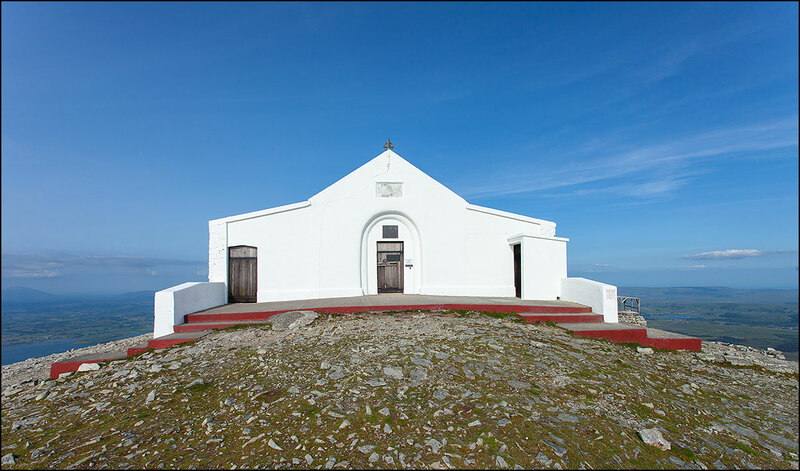 Builders lived in huts on the summit for the six-month period of construction. 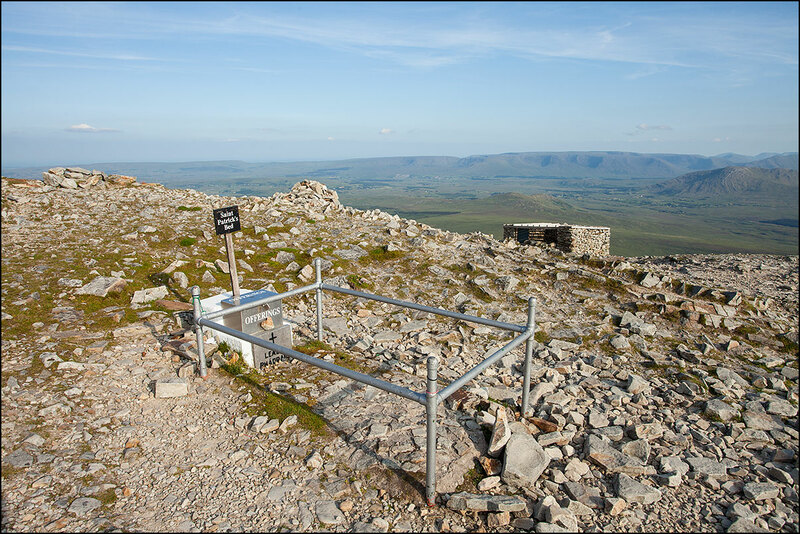 Excavations had uncovered a dry stone oratory – similar to the one at Gallarus in Kerry and it dated from the period 430AD to 890AD. There were a few hours to go until sunset so I relaxed in the shade of the church. Walkers came and went. Some had no more reached the summit when they turned on their heels and headed back down again, a behaviour that puzzled me – why come all this way and not soak in the scenery for a half hour or so at least? The sun began to dim appreciably around 9pm and I took a few photographs as it began to sink towards the Atlantic. A thick blanket of haze soon obscured it well before the actual sunset time of 10:05pm. I headed back down the mountain in the fading light around 9:30pm but I did not need the torch to light the way and I reached the car park at 11pm exactly. 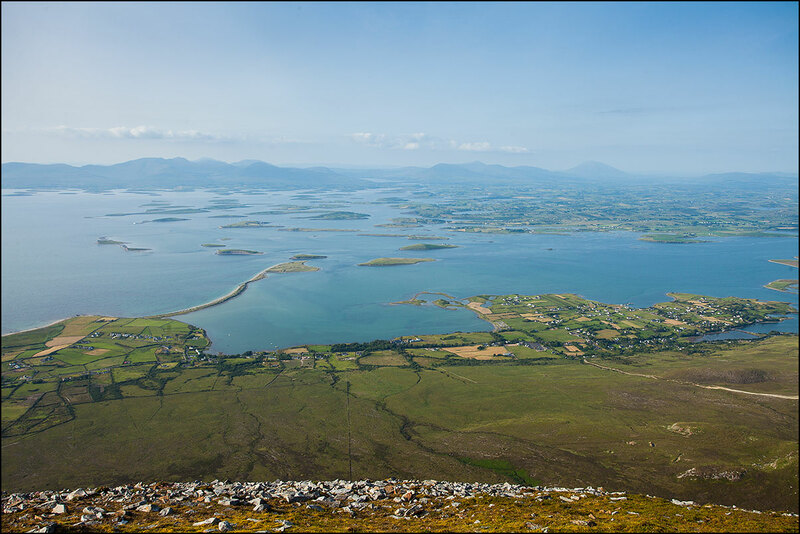 Croagh Patrick is a magnificent mountain and it was a wonderful experience to climb it. That said, I found it very tough going in the 29 degrees heat and in the absence of any wind. I was exhausted at the end of it. My admiration for the people who climb it on Reek Sunday – often in wet and windy conditions – has been considerably increased as a result. 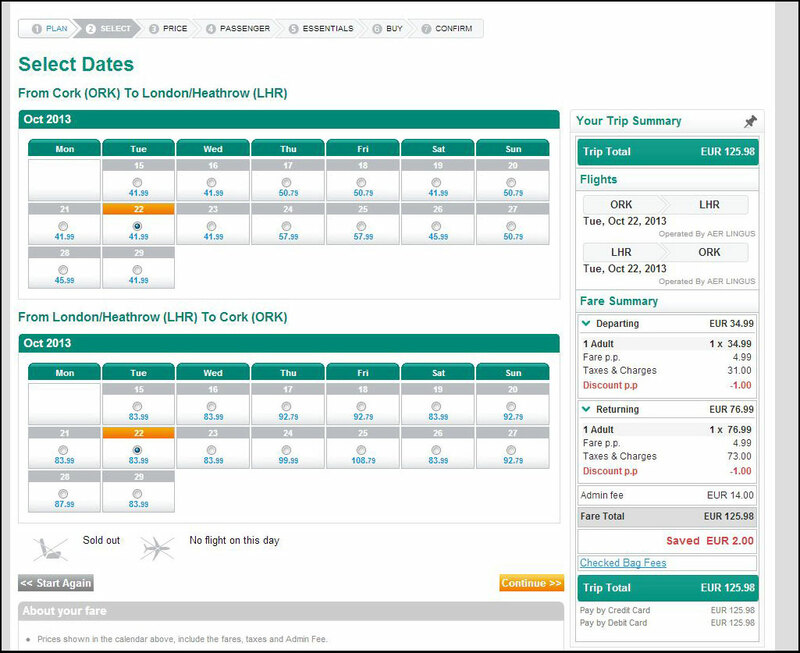 The Aer Lingus 20% Sale That Would Have Saved Me 1.56% … And It’s All Above Board. 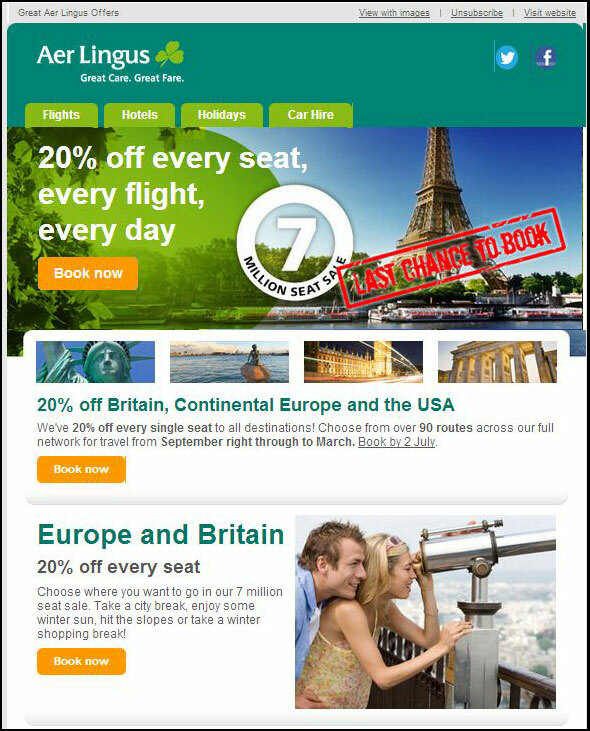 I got an email from Aer Lingus on 24 June offering “20% off all Cork flights – 20% off every seat, every flight, every day”. Sounds good, I thought. I did a quick mental calculation for a flight that would normally cost €130 – about average for Cork/Heathrow return when booked a month or so in advance. I would save €26. Not bad. A day trip to London would be nice. I picked a random date – 22 October – and clicked the “Book Now” button. The actual sale discount amounted to €2 on a total cost of €127.98 – a percentage saving of 1.56%, a far cry from the 20% I was expecting. I felt peeved at being suckered by Aer Lingus into clicking on their site with an offer that proved illusory. Surely this was dishonest advertising? I emailed a complaint to the Advertising Standards Authority for Ireland. Ah, the Terms & Conditions. Silly me for not noticing those. And yes, when I checked them they did indeed specify that the discount applied to the fare only. The fare in this instance amounted to €4.99 each way. And silly me for assuming that “20% off every seat” applied to the total cost and not just a constituent part of it. It’s as if a shop advertised a 20% sale on men’s suits only for the small print to specify that it applied to the left sleeve only. I didn’t book the flight as I wasn’t that bothered about going to London in October. But presumably Aer Lingus’ strategy with these “sales” is to increase the hit rate on their site in the expectation that a significant number of people will book anyhow. Obviously it works as they have such sales every year. Aer Lingus: I like you a lot, you are my first choice for UK and European travel, but the next time you send me an email about a “sale” it will go straight in the bin.